"SIMPLIFY-PEACE OF MIND" SOLUTIONS FOR EFFECTIVE "MONITORING & CLEANING" NEEDS. TO SUPPORT & PROMOTE "SOCIAL ENTERPRISE" TO GROW WITH COST-EFFECTIVE & ECO-FRIENDLY SOLUTIONS WITHOUT COMPROMISE OF ENVIRONMENT. Our solutions also designed to meet current Industries needs to complied ISO, HACCP, 21CFR Part 11, Cold-Chain Audit, NIOSH, DOSH, DOE, GLP, GMP, Preventive & Predictive Maintenance and etc requirements. 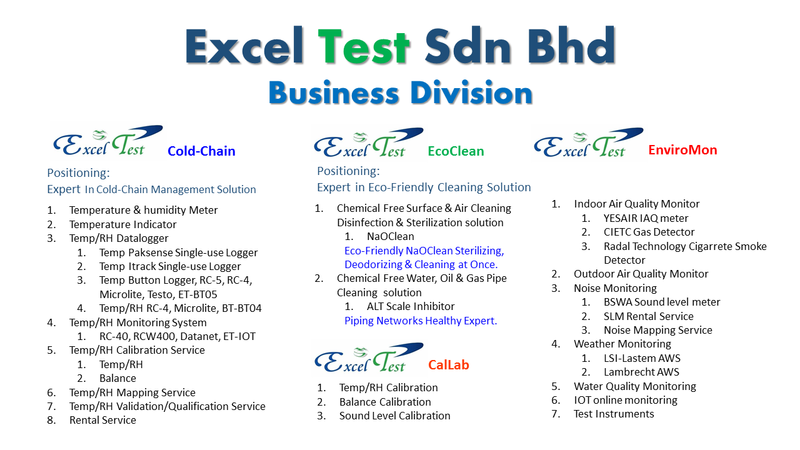 We also offering wide products solution includes "DIY SOLUTION" like datalogger that could be best fit to your quality control, manufacturing process, storage & transportation, utilities supply, waste water treatment, quality, performance monitoring, data logger, tobacco cigarette smoke monitoring & control solution and etc.